Reunion 2019 is coming to a prairie based campus near (or not so near) you May 30-June 2, 2019. Online registration Reunion 2019 is now open. A paper registration form will be mailed to all Reunion classes with the Reunion Newsletter in late February. You may also download a PDF of the paper registration form, fill it out, and mail it in to the address on the form. Don’t forget to include your payment. See who is coming to Reunion! Each Friday now until May 17, we publish a list of alumni who have registered for Reunion. This list includes all alumni who registered through Thursday in a given week. View the Reunion 2019 attendee list. To help with your planning, we have created a preliminary schedule. Please note: this schedule is tentative and times, locations and offerings may shift. Additional items are being added as classes clarify their programming. 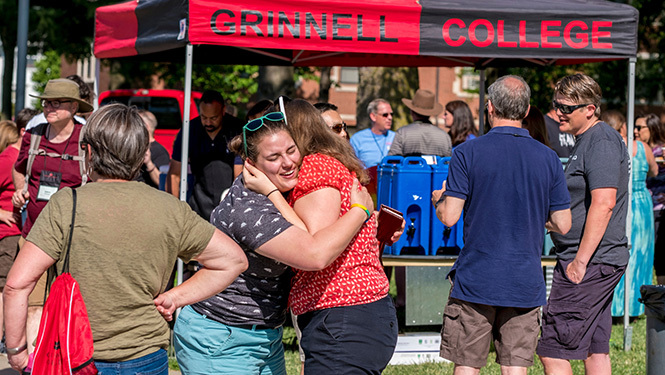 A final schedule will be available at registration and will published in the Grinnell Reunion App. The 2019 Alumni Award recipients have been announced! Make plans to attend Reunion to honor your classmates and friends. For more information, and to see who will be honored at Reunion this year, visit the Alumni Awards page. The theme for Alumni College 2019 is Diversity is about all of us. Visit the Alumni College page for more information. If you plan to attend Alumni College, please note registration for Alumni College and Reunion have been split into two separate registrations. Registration for Alumni College opens on February 1. When is my next reunion? Reunion is typically scheduled for the weekend following Memorial Day. This Reunion calendar shows the schedule through 2029. Thank you to everyone who attended Reunion 2018 and made it a great weekend on campus. Take a look back through our featured story and our Reunion 2018 slideshow. See a selection of memories from the weekend. During Reunion 2017, George Drake '56 president emeritus of the College and professor emeritus of history spoke on how students started shaping Grinnell during the sixties and the tradition continues today. It WAS a Revolution! Reunion 2016 brought together alumni and friends from all over the country, and even the world. Check out Reunion 2016 highlights. What a great weekend! Revisit the experience with archived photos, videos, and more. See archived photos, videos, and more from 2014 Reunion Weekend and Alumni College.